It all began in the summer of 1990. I had graduated from UCO in the fall of 1989, a good friend of mine graduated from OSU the year before. As often happens to friends who grew up together, we had already begun to go our separate ways after school. He moved to Fort Worth to work while I remained in Oklahoma City. We decided to do one last thing together, a vacation. In trying to decide where to go, I had always wanted to see the Grand Canyon, he wanted to go see Los Angeles. We decided to do both, in 9 days. I had planned to take my car, but when getting a tune-up and oil change the week before the garage had cracked the oil filter, and when test-driving it after the tune-up managed to blow up my engine. You would have thought that I would have taken this as an omen, but I didn’t. Anyway, this little detour didn’t bother us, as we were enjoying the views, but we were now towards the North Rim of the Grand Canyon, not the South (having not read so much as brochure, we didn’t know the difference). When we got the North Rim Lodge, around 3:00pm on day 3, we tried to get a room. We were number 20 on the "waiting list" and they ended up with two cancellations. We decided that since we couldn’t get a room, we would just camp instead. At this point in my life, my entire camping equipment list consisted of a $20 dome tent from Wal-Mart, a $30 wool sleeping bag from Target, duct tape, a pocket knife, a 2 "D" celled waterproof flashlight and two one quart "GI Joe" style canteens I had bought at a gas station on the way. Our next stop after the lodge was the backcountry permit office. Again we were told that we needed to be on a waiting list, and come back tomorrow at 10:00AM to find out if we would get the permit. We ended staying in Kanab, Utah, the first place we could find a room. (Look at a map, Kanab is several hours north of the North Rim). Leaving at 4:00am (Local time) on day 4, we proceeded back to the permit office. As luck would have it we got a permit. It would allow four people to proceed down the North Kaibab to Bright Angel campground on day one (Drop from 8,145 to around 2,800, 14.4 miles), return to Cotton Wood on day two (back up 1000 feet, 7.2 miles) and finally back up to the North Rim on day three. 14 miles sounded deceptively simple to us, we conveniently ignored the change in altitude and our complete lack of experience. We split the four person permit with two German tourists who had also been on the waiting list and then proceeded to ask questions of the Ranger. Where is water on the trail? What are the trail conditions like? Do we have to stay on the trail or can we bushwack? The last question about bushwacking led the Ranger to ask us a question, "have we ever done this before?" When we admitted that we had not so much as dayhiked, he proceeded to try and take back the permit he had just given us. But being cocky young studs (Remember, I’m only 23 at the time) we managed to convince him that 14 miles "wouldn’t be a problem" for us. He reluctantly agreed to let us go. Now remember from my earlier description of camping gear, I didn’t have a backpack, stove, special clothing, sleeping pad, food, or hardly anything else. The night before the trip to get the permits, we had stopped at the Safeway in Kanab. I had brought my book bag from College, (a small daypack) which I proceeded to load up with "camping food" from the local Safeway. This included such staples as chicken soup (in the can), beef jerky, peanut butter and crackers, english muffins, and life saviors (cherry, of course). I also purchased some nylon cord with which to tie my sleeping gab onto the daypack, spare batteries for my flashlight (2, size D), sun screen, Band-Aids, gauze pads and extra duct tape. My friend, who purchased similar supplies, didn’t have so much as the daypack. He took one of the duffel bags from our luggage, some of the cord, the duct tape and an extra belt and built a pack, using the belt for a shoulder strap. Let me take a moment at this juncture to point out that every word in this story is true, as even in my wildest dreams I couldn’t make this stuff up! My clothing inventory for the three day trip, including what I had on, consisted of two pairs of shorts, two shirts, two pairs of socks, three pairs of underwear, sunglasses, Nikes and a baseball cap. All 100% cotton, of course. My friend packed about the same, but he wore the same steel-toed boots he wore when riding his motorcycle. It was cool, in the 70’s, when we started off (about 11:00am by now) for day one of our adventure. The two German tourists, both young women who had experience hiking, quickly left us with their faster pace. We ended up hiking with two Americans, a couple where the husband was experienced but the wife was taking her first trip. They were only going to Ribbon falls, about six miles and a slight detour for us. We made it to the falls in reasonably good shape, after all it was all downhill, we were fresh and didn’t have heavy packs. While at the falls, I consumed all of my water. I knew that a purified water source was less than two miles away, which sounded close. The experienced hiker tried at this point to give us his iodine tablets, but we wouldn’t take after he told us that it made the water "taste funny." As you will learn later, this turned out to be a nearly fatal mistake, as the last 8 miles of the trip is along a stream, but we had nothing to purify the water with. As we then separated from the couple, we had to go a short distance back up hill before we could proceed back downhill to the water. Now, although it was cool at the rim, at this point we were nearly at the bottom of the canyon and had descended several thousand feet. It is August, it is early afternoon, and there is no shade to speak of in this desert eco-system. We learned later that at Phantom Ranch, a high of 104F was recorded that day. After a short distance, I turned to my friend and asked him for some of his remaining water. Understand that I was hot and not in as good as shape as he was physically. And after all, I reasoned, this was my buddy, a friend that the Bible would call "closer than a brother." I had known him since the seventh grade. We worked together, we went to school together, in short, he knew me better than anyone else. In fact, one time when my car broke down he took off work, came to where I was and worked on it with me. This friend’s response? First it was simply no. But then as he thought about it, he said, "I will sell half of my remaining water for your extra pair of socks." You see, his steel toed motorcycle boots had managed to cause several painful blisters, and we aren’t even half way to our destination on the first day. I reluctantly sold him my socks for the water. Upon reaching Cottonwood, we were able to refill out canteens and rest our weary feet. My friend had already used up all of the gauze pads on his blisters and was now wearing both pairs of his cotton socks and the extra pair he bought from me for a pint of water. We reluctantly left Cottonwood in the early afternoon and headed for Bright Angel campground, our destination for day one. We managed to struggle into camp just before sundown and set up our tents. I had again run out of water before reaching camp. We had no sleeping pads, just our wool sleeping bags (of course, it was over 100 degrees) so we crawled into our tents and slept on top of the bags. In the middle of the night deer came up and licked and nuzzled the tents looking for food, keeping us awake; not that we were getting that much sleep to begin with. The next morning, I awoke around 8:00 am and stayed in the tent until 10:00 am, after which my friend and I had a discussion; we knew that we had to start back sooner or later or we would never get home. Now the North Kaibab trail descends a side canyon (Bright Angel) into the Grand Canyon and as it approaches the Colorado River the side canyon narrows. So as we looked out of the campground we saw lots of shade. Not being of sound mind at this point, we decided to head out back to Cottonwood campground at about 11:00 am. The Colorado river is only few hundred yards from Bright Angel campground, but I never saw it on this trip. Instead of wasting the energy to take the detour to the river, I simply headed back towards the North Rim after downing some lemonade and crackers from the canteen. What this piece of idiocy resulted in was that we reached the area where the canyon widened at about 1:00 in the afternoon, when the available shade was minimal. Once again, I ran out of water. At about 1.2 miles from Cottonwood there is a little hill. By little, I mean small, no more than 75 feet. But when I reached this hill I was so exhausted by the heat and lack of water that I couldn’t make it. I encouraged my friend to go on without me, I needed to rest. If he didn’t hear from me with three hours, he was come back with water. I then proceeded to sit down in the creek to cool off. If I had only taken the iodine tablets I had been offered on day one, I would have been much better off. Eventually I did cool off but still couldn’t seem to make it over the hill. I finally dropped my pack and managed to make it over, my primary goal was to get water. I stumbled into camp to find my friend had fallen asleep with his blistered feet in the creek and hadn’t realized the time that had gone by. I got water, rested and eventually went back for my pack. So ended the second day. My food preparations that had been done at the Safeway in Kanab had included items that didn’t need to be cooked since I didn’t have a stove. The first day I had eaten things like the peanuts, crackers and uncooked English Muffins. For dinner on the second day I ate cold Campbell’s chicken and rice soup, English Muffins and beef jerky, washed down with warm water. Late on the second day, a ranger came by to check on permits. He saw us moaning and groaning but this was after dinner and water so we looked somewhat presentable. He prepped us for day three by encouraging us to get an early start and going steady, he seemed confident that we could make it to the top in one piece. We started getting ready for the third day by getting up at 4:00am. You have to remember that our bodies are still on Oklahoma time, so 4:00am felt like 6:00am. Even so, it was almost 7:00am (local) before we got under way. I drank plenty of the warm water. We had managed to get more sleep than the first night by sleeping on the picnic tables instead of inside our warm tents, and being exhausted didn’t hurt. We went about 200 yards when I threw up. My "power meal" of day 2 didn’t lend itself to an aggressive hiking regime. My friend, who still had only his steel toed motorcycle boots to hike in, had taken to wrapping his feet in duct tape to control the blisters (I am not making this up) and didn’t want to stand around. It seemed that when he moved his feet went numb but when he stood still they hurt quite a bit. He went on ahead to the next resting spot. The next resting spot is a Ranger’s house about a mile from Cottonwood. Out behind he had a lemonade stand on an "honor" system. It consisted of a Gott cooler of cool lemonade, cups and a box for "donations." On the way down I had eagerly consumed a cold cupful and had dropped in a couple of quarters. Now, on the way out, I drank several cups and dropped in five dollars. It was worth every penny. Of course, minutes later I threw up again. At this point, my friend and I agreed that he would go on since if he kept walking his feet didn’t hurt as much as standing still, and since the trail sees relatively a lot of use I didn’t seem to be in danger. So, off I went, up the trail. Of course, I threw up one more time just to be sure…but seriously my pattern went something like walk five minutes, rest five minutes, walk five minutes, rest ten minutes, walk five, rest five and so on. The interesting thing about the initial part of the hike is that although it began with people passing me on the way up, no one had yet reached me on the way down. As the day grew on, however, people "from the top" began to pass on their way down. Some of them even offered me water. Water, that precious thing of life. Water, that thing that I had run out of on day one and day two. Water, how could they afford to give some up? I refused their offers. Yes, refused. I didn’t really believe that they could afford to give it away. Around lunch time, I had consumed just over half my water but was still a long way from a water source. I had sent all of the food along with my friend to save weight in my pack, besides I figured that with the early start I would near the top by lunchtime, I wasn’t. Now, this entire experience was drawing me closer to God. I was praying quite frequently…"Dear God, get my out of here!!!" As I sat down on the side of the trail to take a break I laid my left arm down and felt something odd…it was a canteen full of water. Now, maybe you can say that one of the people on the way up left it for me. But at that moment in time I felt than an Angel of the Lord had left it for me to find. How else to explain that I almost sat on it? Anyway, I waited for about 15 minutes to see if anyone would came back for it, shouted to see if anyone was in ear shot who might be searching for it, and then proceeded to drink a lot of it, then used the balance to refill my canteens. Refreshed, I went on for about another hour before deciding to take a short break. I had found a small alcove in the rocks that was in the shade and had a smooth rock perfect for a little nap. Now you must remember that the Grand Canyon is frequented by many foreign tourists. So as I was "resting" on the rock, I heard a voice of a little girl in a distinctly British accent saying, "Mummy, why is that man using a rock for a couch mummy? Why is he doing that?" Before the mother could respond I rose up and engaged the family in conversation. A couple, along with their daughter who appeared to be around 12 were going down to the bottom for the day. "A pleasant little hike" they explained. Well, I implored them to turn back now. I assured them that the trip down was much easier than the trip up and that this was no place for a 12 year old. They thanked me but went on anyway. I went on upwards. About thirty minutes later, they passed me on the way up. They said that they had been talking among themselves and after considering how I looked, they turned around and headed back up! After another couple of hours, now mid afternoon I reached a rest area with water that also served as a watering corral for the mule trains traversing the trail. This is approximately two miles from the top. Normally only one "mule train" should be in the area at once. However, due to some scheduling difficulties, three "trains" arrived at the same time, two from the top and one from the bottom. Surrounded by all these people, mules and still feeling quite tired, I stood up on a rock and said, "I’ll give $50 to anyone who will give me their mule and walk back to the top." I got no takers. You see, I hadn’t realized at the time but I looked quite terrible. Aside from being sunburned in places where I hadn’t put enough sunblock, my cotton t-shirt and shorts were soaked with sweat. And each time I "rested" I had collected some of the dust along my back. The net effect was that I was sweaty, red faced and covered in mud. What I did get out of the offer was that one of the mule handlers came over and gave me some ERG powder (kind of like Gatorade) to mix with my water. Also a tourist from Australia insisted on taking my pack from me and carrying it up, he was on a dayhike and was only going this far. My friend, who had already managed to make it to the top and re-bandage his feet without using duct tape, had fallen asleep in the car. He felt safe in doing this since he had inquired of other hikers coming up if they had seen me. Those hikers had explained that they saw me resting under a tree, resting under a rock, resting on the trail, resting off the trail, etc. And although no one actually saw me walking, he knew that I must have been making some type of progress since people saw me in different places. He awoke just in time to see a stranger walking up to the car carrying my pack and mildly freaked out, thinking that some type of rescue mission was in progress and this was the first thing they found. Fortunately, I managed to make it back to the trailhead a short time later and so ended my first ever hike into the wilderness, three days of shear torture. The funny thing is that in some sick way I enjoyed it. I knew in my heart that basically if there were 200 things to do on a hike / backpack, I did 199 of them wrong. The only thing I did right was live to tell the tale. If I had done some more things right it would have been downright pleasant. I have since returned several times to the Grand Canyon. The next year I went back to go on a seven day rafting trip. We started from Phantom Ranch. In order to reach Phantom Ranch a hike down the South Rim (Bright Angel Trail) of about 10 miles was required. We had to be at the beach by 12:00 noon to meet the rafts. A different friend of mine was along for this trip and he had heard the story about the first trip on the long drive out to Arizona from Oklahoma. I know what you are thinking, but I’m still good friends with my first Grand Canyon hiking buddy. After hearing about the struggle to reach the river the first time, I was able to convince him to get to the trailhead while it was still dark. As soon as it was light enough to see we started off. We raced down the South Rim and got to Phantom Ranch with hours to spare. This provided me both the chance to see the river that I missed on the first trip and to hike further up towards the North Rim to revisit some of the infamous sights from the year before. At the end of the rafting trip, I was taken by helicopter up to a ranch, and from there back to the South Rim by plane. Now that’s the way to get out of the canyon! The next trip the Grand Canyon was in the fall of 1996. This is after I have had the opportunity to join the Sierra Club, take the backpacking workshop and go on several backpacks. I had good hiking boots, comfortable clothing (not all cotton) and an appropriate pack. Unfortunately, it was a spontaneous trip and we didn’t have backcountry permits. So a friend of mine, a fellow Sierra Club member, and I arranged to do a North-South Traverse in one day. We left the North Rim via the North Kaibab at 7:00am in the morning and reached the South Rim via the Bright Angel at about 9:00pm. The last 2 ½ hours were in the dark, via flashlight. This represents a distance of just over 24 miles and a descent of around 5,000 feet and an ascent of about 4,000 feet. 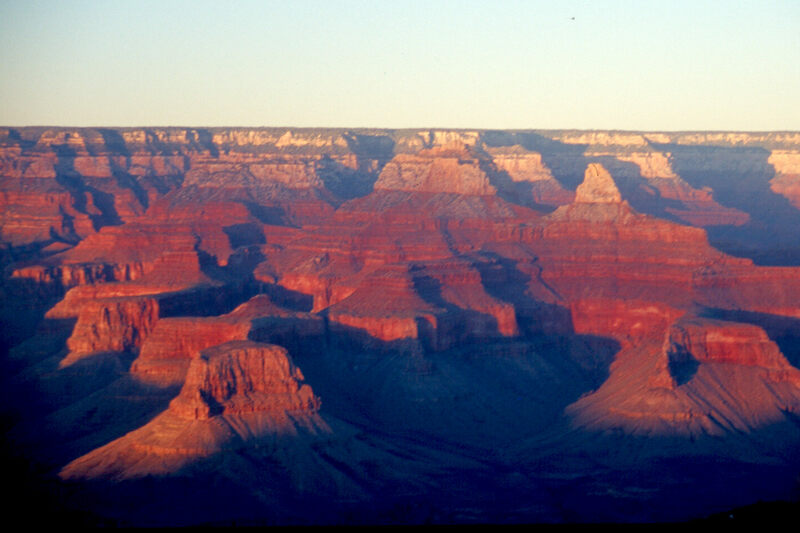 As I collapsed into the hotel bed, I was finally able to say that I had "gotten the Grand Canyon out of my system." Although I plan to go back, if something happens and I don’t get to, I’m satisfied that I have learned how to plan and execute a backcountry trip now. And I owe it all to the Sierra Club and the great friends I have made in the club who have shared their backpacking tips and who helped present the backpacking workshop. The next trip was a backpack from rim to rim, taking three days and enjoying the view along the way. The other trips have just been day trips to the South Rim on the way home from Utah backpacking trips. It makes a great spot to spend a day and rest up before the drive home. and to Outdoor enthusiasts interested in Oklahoma.